The majority of IBR’s software engineers have large system integrator experience where they learned and became practitioners of CMMI-level III processes for the software development activities. Our engineers have experience in being part of the CMMI internal audits and understand the benefits of following standard process to improve communications and quality for software and system development. Our CMMI-level III experience will demonstrate to customers that we are fully committed to continuous process improvement that assures the delivery of superior products, services and solutions. CMMI-level III experience has increasingly become a differentiator and is aligned to our process-driven yet agile culture at IBR. We look at each project and use tailoring techniques to ensure we work under well-defined process that are applicable to the specific project we are undertaking. 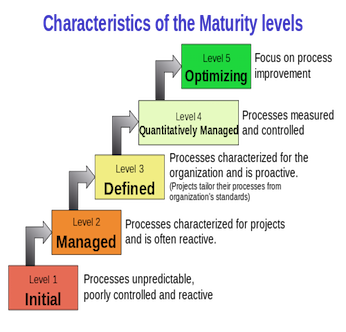 At maturity level 3, processes are well characterized and understood, and are described in standards, procedures, tools, and methods. The organization’s set of standard processes, which is the basis for maturity level 3, is established and is continuously improved over time. These standard processes are used to establish consistency across the organization. Projects establish their defined processes by tailoring the organization’s set of standard processes according to tailoring guidelines.